Madurakali Amman temple is located in Siruvachur town, off Trichy, Chennai roadway, at 8 km separation from Perambalur and 44 km separation from Tiruchy. 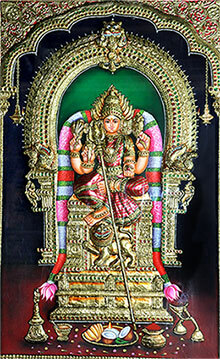 The Goddess is known as Sri Madhurambhika. The Temple is little with a primary holy place and one prakara. A little tower and a lake outside the sanctuary are found. Madura Kaliamman is in the sitting carriage with four hands. There are few town gods found in this little sanctuary. There are numerous legends connected with this sanctuary. It is accepted that the sanctuary is extremely old (however not the current structure) and it was even revamped by Kulothunga Chola. According to one legend, Kannagi of Silappadikaram cooled herself in this site in the wake of smoldering Madurai city. According to an alternate legend, Chelli Amman was the first god of the spot. In any case, she was controlled by a tantric. Madura Kaliamman obliterated the tantric and protected Chelli Amman. Chelli Amman offered this site to Kali and moved to a close-by slope hill.